1. 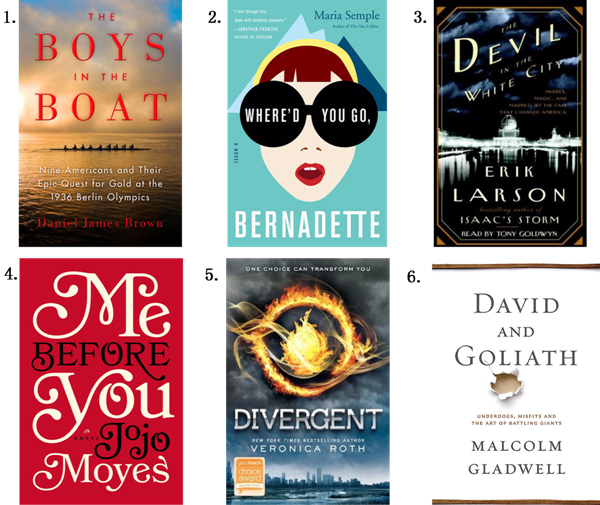 The Boys in the Boat /Daniel James Brown/My favorite book, hands down of 2013. I honestly could not put it down. Historical fiction, naturally. The tale of the US Olympic men’s rowing team and their road to the 1936 Olympics in Nazi Berlin. Put it on your list! 2. Where’d You Go, Bernadette /Maria Semple/ An interesting read that follows Bernadette Fox, a brilliant architect who has fallen off the map and her quirky family. 3. The Devil in the White City /Erik Larson/ This one has been on my list for ages! The story of the 1893 Chicago World’s Fair following two men: Daniel H. Burnham, the architect responsible for the fair’s construction, and H.H. Holmes, a serial killer masquerading as a charming doctor. 4. Me Before You /Jojo Moyes/ The untraditional love story of Lou Clark and Will Traynor. Tears will be had with this one. 5. Divergent /Veronica Roth/ Basically 2014’s answer to The Hunger Games series, dystopian society, girl heroine, it is all good (check out the movie trailer here). 6. David & Goliath /Malcolm Gladwell/ This was a Christmas gift and I was so excited. The story of the underdog and how the weak defeat the strong is explored in Gladwell’s classic style of numerous narratives. This entry was posted in books and tagged bernadette, david and goliath, divergent, Goodreads, january books, me before you, the boys in the boat, the devil in the white city, where'd ya go. Bookmark the permalink.